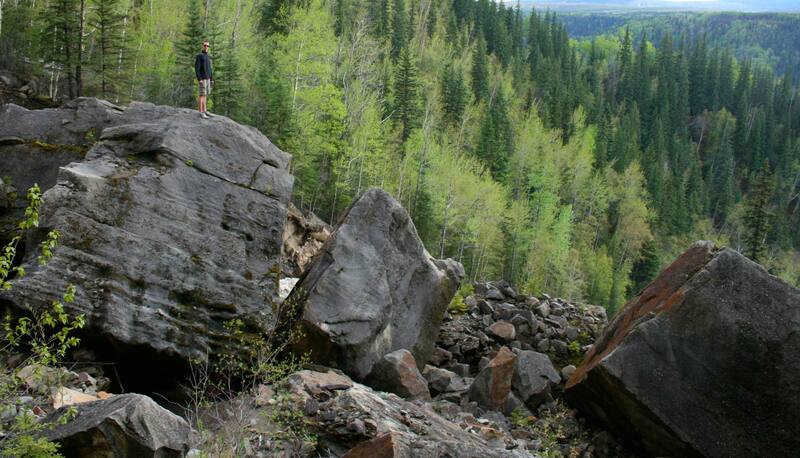 The 3 kilometre hiking trail to Tepee Falls was built and registered in 2001. In 2002 the area surrounding this initial part of the trail was subjected to clear-cut logging. Members of the Wolverine Nordic and Mountain Society then re-established the trail and removed the debris from the logging operations. In 2014 selective logging of trees infested with the Mountain Pine Beetle was performed in this area by West Fraser Mills. Care was taken by the company to preserve the hiking trail and remove debris. 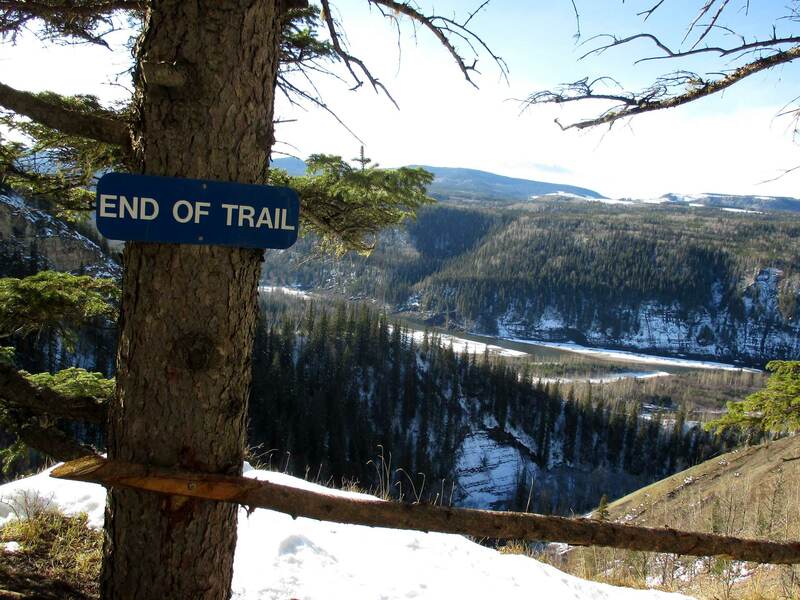 This example of constructive co-operation between a logging company and the Wolverine Nordic and Mountain Society has resulted in a safer trail. Tepee Falls plunge off the lip of a thick-bedded layer of resistant sandstone , dropping fifteen metres into a deep valley. 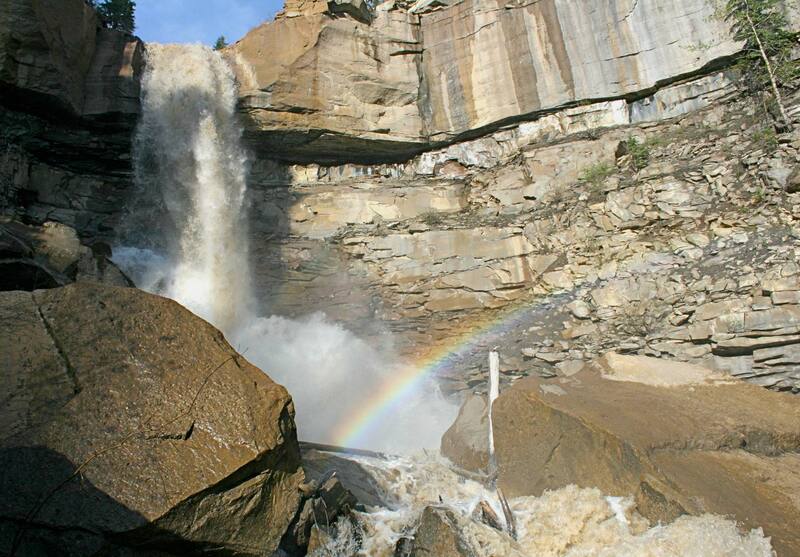 Fifteen years ago the upper falls were much more dramatic, and formed a single vertical drop. Flood events have changed their appearance significantly in this short period of time, eroding the rock layers to create more of a cascade. 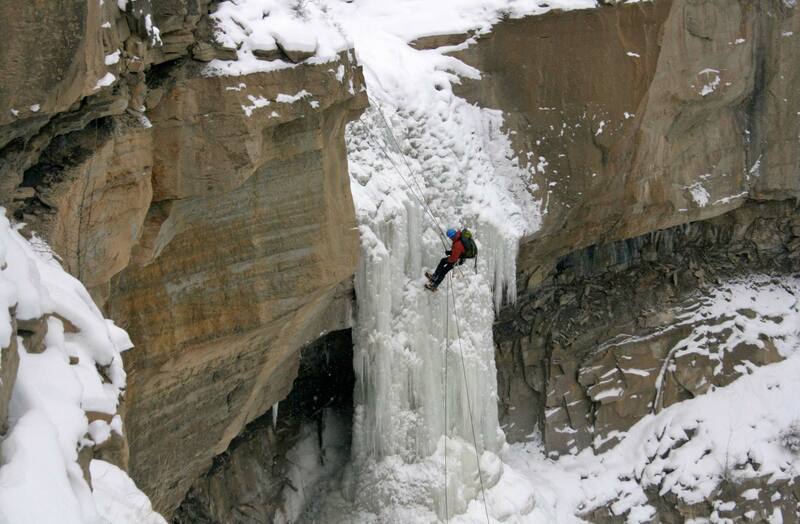 In winter the falls freeze over and become a choice ice-climbing destination. Eroded portions of the cliffs eventually separate and crash into the valley below, leading to the chaotic jumble of blocks between which the creek descends rapidly. These rocks are about 90 million years old, and form a distinctive part of the Cardium Formation from the Upper Cretaceous Period. These thick-bedded layers tell of a high-energy environment, which generally would not have been suitable for fossil preservation. 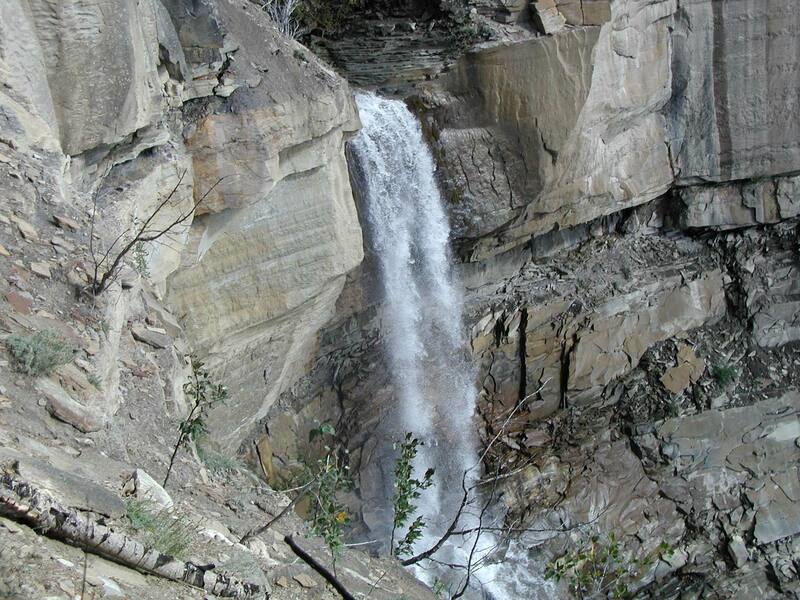 In amongst the fallen blocks at the foot of the falls, however, are a few blocks with interesting surface features. These include the only dinosaur trackway known from the Cardium Formation, discovered in 2009. They were made by an ornithopod. 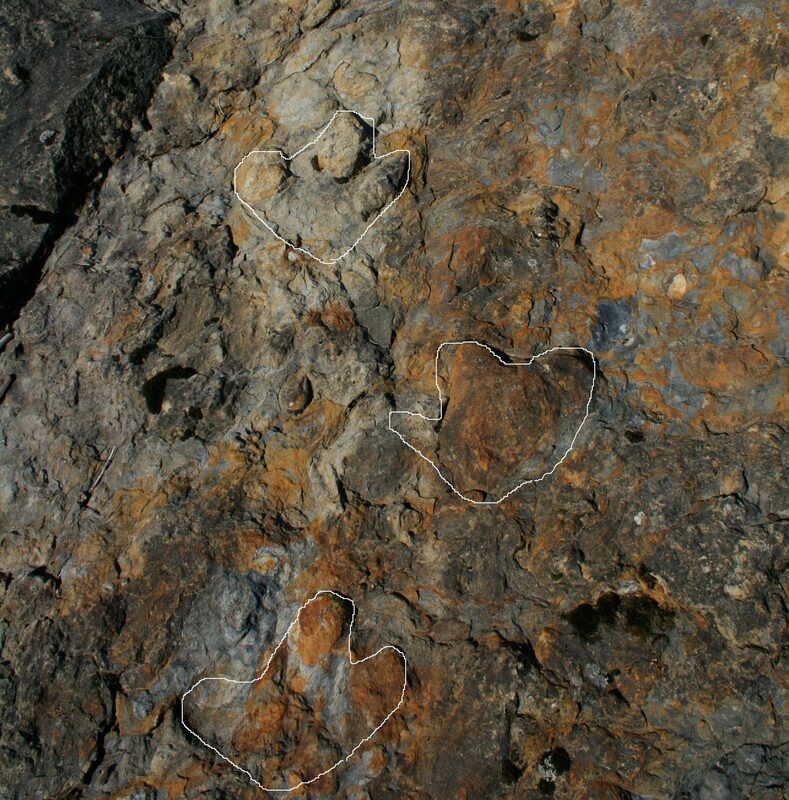 Cardium Formation rocks also are exposed in a road cutting on Highway 52 to Dawson Creek, known as Graffiti Hill, where a large inoceramid clam fossil was recovered. The Cardium Formation also contains fossilized cockle shells (family Cardiidae) and takes its name from these fossils. 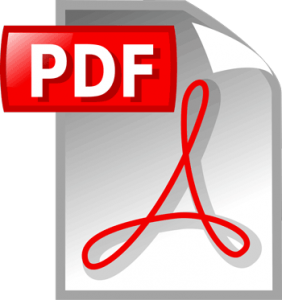 It is present through much of western Alberta and northeastern British Columbia, and it is a source of oil and natural gas. The rock layers lower in the valley are much thinner, with alternating layers of sandstone and shale. These are from the slightly older Kaskapau Formation, 91-93 million years old. 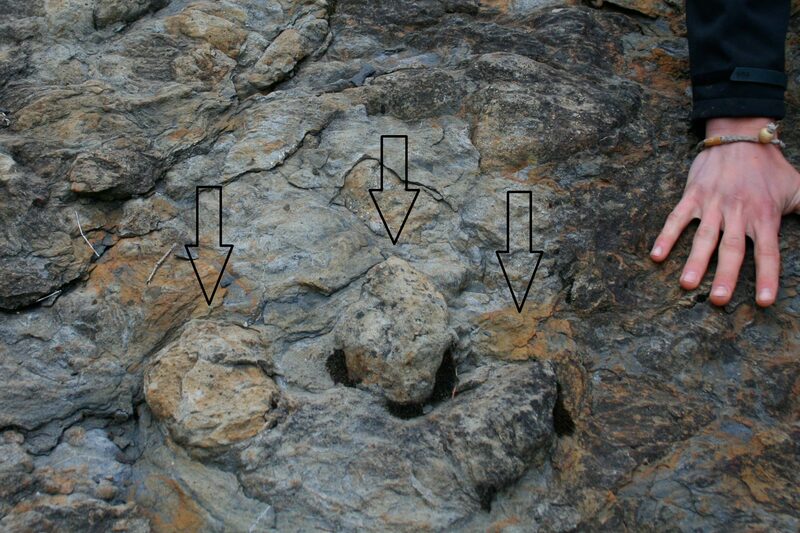 Both Cardium Formation and Kaskapau Formation rocks were deposited along the western edge of the Western Interior Seaway, which bisected the continent from north to south. Alternating layers of marine and non-marine (terrestrial) sediments tell of a coastline that was sometimes a delta environment and sometimes submerged below sea level. 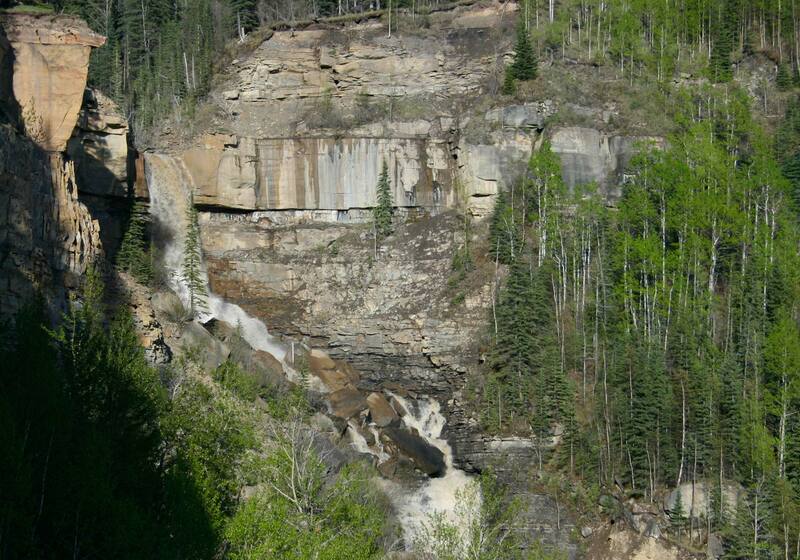 The lower falls cascade down the softer, thinner-bedded layers of the Kaskapau Formation. 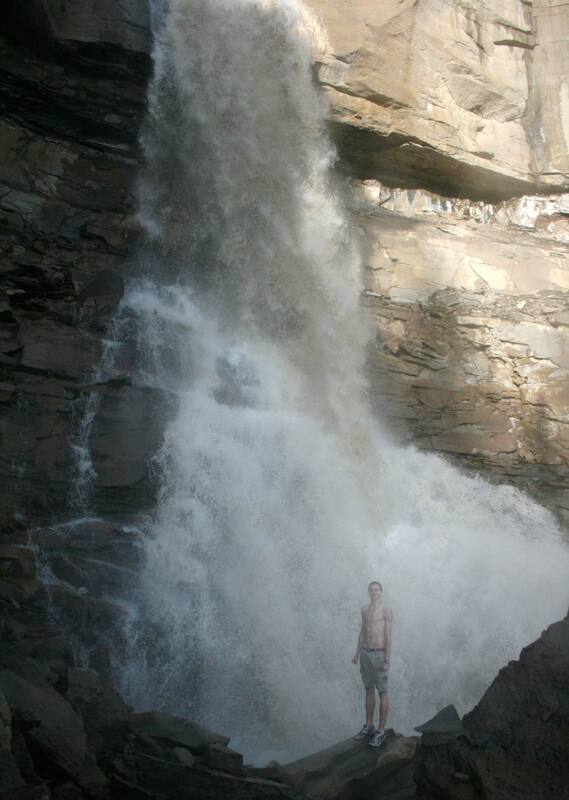 This is in marked contrast with the main falls, which plunge off the vertical cliff that is formed by the thick-bedded layer of the Cardium Formation. Once it approaches the level of the Murray River, Tepee Creek curves right, then left around the bottom of a final ridge, and inconspicuously enters a quiet side channel of the Murray River. Tepee Creek is one of many tributaries of the Murray River that enter the valley by means of spectacular waterfalls. The river valley was deepened when the great Pleistocene ice sheets melted, and the tributary creeks form waterfalls and deep canyons where they encounter resistant bedrock. The flow rate of the Murray River varies significantly, with a mean of 56 cubic metres per second, dwindling to ten in February, rising to 193 in spring run-off, and with a record of 872 cubic metres per second in 1990. The river rises in the Hart Ranges of the Rocky Mountains at the Bulley Glacier, over 2600 metres above sea level. In their journey to the Arctic Ocean near Inuvik via Mackenzie River, these waters encounter no human-made obstacles, but instead just encounter a few river-wide ledges downstream, the Vermilion Chutes on the Peace River, and the Slave Rapids near Great Slave Lake. There are precious few rivers left in North America that are as untouched. 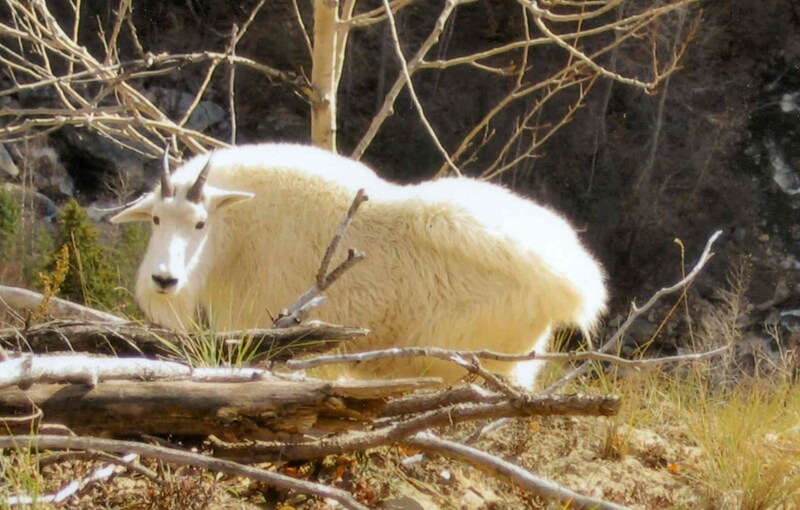 Keep an eye out for mountain goats on the black shale cliffs of the lower valley. These animals, seemingly out of place in a canyon some 40 kilometres from the nearest alpine cliffs, can live wherever they can find steep enough terrain to avoid their predators. 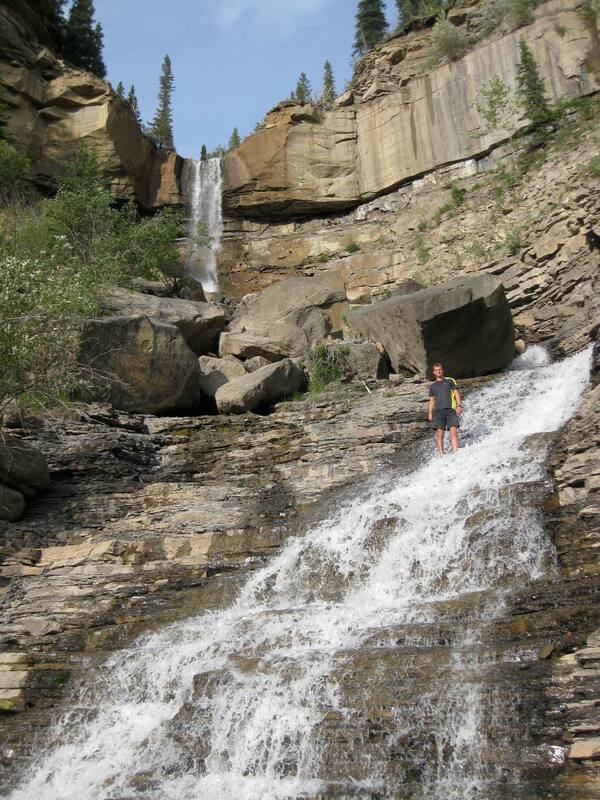 Venturing from the end of the hiking trail to the base of Tepee Falls is challenging, involving rough terrain, steep descents down game trails, and steep exposed traverses. This is not generally recommended, and is suitable only for the most confident (goat-like) adventurers. The rewards, however, are great, especially when the Tepee Creek is in flood.